The world has been lost among the modern setup of the 21st century, yet a place like Goa with its epic history stands out from the rest because of its rich and original Heritage that lies in every aspect of its infrastructure. Being the land of churches, temples, beaches and forts, there is so much mystery in every little thing. Humans like to, need to, leave memorials behind to describe their deeds to generations that follow them. When such Heritage walks are conducted in Goa, it involves personal observations thus offering various shades of the heritage sites. Also, the experience creates an emotional attachment to the place, culture and the values connected to those heritage sites. The interesting fact is, a number of people are inspired by the heritage of Goa and conduct research on these Goan heritages like the most recent one ‘Old Goa Revelation’ project, where the study and preservation of the Shared Heritage of Portuguese Origin and the insights on the Vice-Roys Portrait gallery were highlighted. GOA IS MUCH MORE THAN HISTORICAL FIGURES! Pooja Rani, the Co-Founder of khoj-aao! Adventures profess, exploring Goa’s backyards as a great way to reconnect to local culture, traditions and the environment. “The villages across the State provide the perfect opportunity to learn about what makes Goa so amazing – the interconnectedness of all aspects of life,” says Pooja. Apart from Heritage walks, even certain events bring to light the ancient history of monuments in Goa. For example, the Ketevan Music Festival that accentuated Queen Ketevan’s history and how her body was found in the ruins of St Augustine’s church. 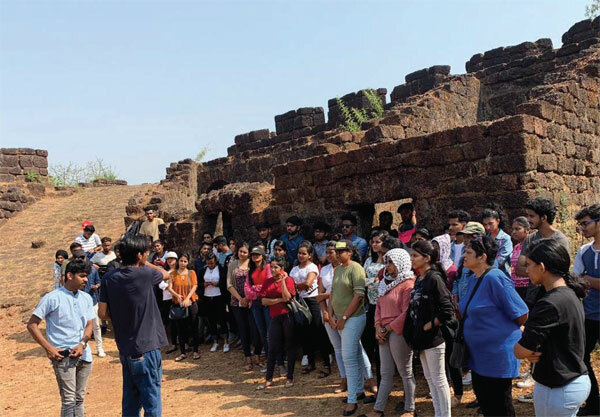 Many schools and colleges often organize these kinds of Heritage walks or treks, to make it fun in order to educate students and make them well aware about the culture and heritage of Goa. Events like the Goa Carnival and Shigmo Utsav are a huge part of Goa’s heritage. These kinds of celebrations need to be preserved for future generations. Thus, we see that heritage is a very broad term. Heritage trails and Walking Tours, talks about the group’s unique collaborative approach connecting travelers with local communities and experiences, and aims at transforming the general clichéd perspectives about Goa. Tourism is a platform to showcase local creative talent and aspire to create thriving career opportunities for local artists. Tourism is also a great way of promoting the heritage of Goa. “Our Heritage Walk give tourists visiting Goa an opportunity to experience the real essence of Goan culture, heritage and the warm hospitality of local hosts,” says Maria Victor. One can see the Portuguese influence in houses in remote villages, in food, and in language. One of the most famous spots for a heritage walk is a stroll passed the tiny streets and lanes of Fontainhas in Panjim, where many groups have conducted numerous heritage walks because of the Latin Quarters; Old Goan-Portugal depiction in the inner roadsof Fontainhas. Another popular tourist spot and heritage site is Old Goa, which has so many churches, each with its own meaning, history and secret. The Golden bell, he growing cross, St Francis Xavier’s relic, St Augustine’s ruins, Monte Chapel, and more; they all have a deep values. Following that is Dona Paula jetty that has been used for many film shoos and known to be a symbolic spot for lovers, after the rumors of Dona-Paula Statue. Other statues around the city of Panjimlike Abbe Fariaare placed neatly with the work and title of the respected persons.